The new Acura RDX has been completely redesigned, sporting a striking new exterior and an abundance of high-end features, from the dynamic performance of Super-Handling All-Wheel Drive™ (SH-AWD®) to heated, cooled, and perforated leather seats and premium trim accents. 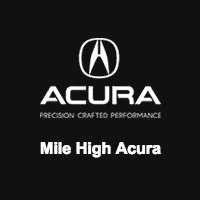 Get this luxury SUV for less near Aurora by taking advantage of the new Acura RDX lease incentives going on now at Mile High Acura, serving drivers throughout greater Highlands Ranch and beyond. Take Advantage of Our Acura RDX Lease Incentives! Step into the all-new Acura RDX interior near Littleton atMile High Acura, where you can secure affordable monthly payments, thanks to our Acura RDX lease deals. Make the trip from Parker or Centennial and stop into our dealership to tour the fully redesigned model during our regular hours. You can also contact our staff for more information about the latest rendition of the RDX. And if you’re ever in need of Acura service, you can always count on the team at our Acura service department.